My name is Kass (with Sir Elmo Pug) – I’m living with cancer. As a Victorian – from June 2019, once the Voluntary Assisted Dying law is implemented, I’ll have a choice. But my fellow Australians in other states and territories don’t have this choice. Please help change this - click here to support our campaign. Our campaign is rapidly approaching the halfway mark and we're at just over $14,000. Thanks to everyone who already donated. You are among the majority of Australians who believe in sensible, humane laws that can reduce the suffering of terminally ill people and their families. It was people like you who helped pass the law in Victoria. While this is great news, we're still a little bit away from the $25,000 target. We've added some options so now you can use also Apple Pay, a credit card stored in your browser or Paypal. 2. Phone a friend and ask them to donate. Tell them this is an important cause that is close to your heart and you'd really appreciate their support. Then ask them to phone their friends! Copy and paste this link into a message: https://chuffed.org/project/GGA-EOFY18 so you can forward it to your friends. 3. Share, share, share - on Facebook and Twitter via the buttons on our Chuffed campaign page. and send it to your friends via text, iMessage, Whatsapp, Messenger, carrier pigeon or even "snail mail". Even if you've done it already, please do it again. Sometimes you need to ask friends a few times. If you (or your friends) prefer to donate via a friendly human, please call me on 0468 464 360. Have a great week and thanks for your support. Together we can right this wrong and help write these laws. Go Gentle Australia is a registered charity. All donations over $2 are tax deductible. My name is Kass – I’m a teacher, an artist, I’m nearly a lawyer. I’m a wife, a daughter, a sister, and since I was a child I’ve been living with cancer. I’ve been living my life and fighting this disease for a long time, and I will continue fight with everything I’ve got. But one of the great comforts to me, in not knowing what the future holds, is that if all the fighting is done and the end is inevitable - I’ll have a choice. I don’t want to die, but if it comes to it, I don’t want to die in intolerable pain and suffering. As a Victorian – from June 2019, once the Voluntary Assisted Dying law is implemented, I’ll have a choice. But my fellow Australians in other states and territories don’t have this choice. Please help change this - click here to support our campaign. Last year’s campaign in Victoria was a great success. Go Gentle Australia contributed to the passing of the first Voluntary Assisted Dying Bill for a state. But we would like all Australians to have access to this law. Despite public opinion sitting consistently on over 80% support, believe it or not, there is well funded and determined opposition to this compassionate law – and they spread fake news – relying heavily on fear, uncertainty and doubt. We’re here to discredit their case by presenting the facts. We collect evidence and heart breaking real stories that help educate our MPs about why Voluntary Assisted Dying laws are important. We use every last dollar from our donations from the public to make that possible. Let me be blunt: we need money to keep the organisation running. That’s why we’re running an end of tax year appeal. We can’t defend the gains, like the Victorian laws, nor get ready for the next fight, like the coming campaign in WA, without your support. The more people who get involved in this campaign, the more we can do to influence politicians, replace fear and untruth with the facts, and give more people the choice and rights they should have. We’ve achieved so much already, but to really win, we need more good people onside and more support. And please, take your impact even further by sharing the campaign as widely as possible. Together we can right this wrong and help write these laws, and help end the suffering of terminally ill people. As Andrew Denton mentioned in our last newsletter, there is movement across the continent towards legislation with inquiries underway in WA and the ACT, and a campaign in QLD to start one. The above map gives a quick overview. Over the coming months we will be working hard on developing myth busting materials to help counter the FUD (Fear, Uncertainty and Doubt) that opponents bring up again and again, despite The Facts telling a different story. Similar to what's happened in SA and Victoria, the same discredited arguments are put forward in WA. We are your voice in this debate - using facts, first person testimonies, and powerful advocacy from doctors, nurses and palliative care experts to counter the conservative and religious voices, that seek to stop this legislation every time it is proposed. Opponents to this law have significant resources. To counter them and their arguments effectively we need your support. Go Gentle Australia is not just about Voluntary Assisted Dying. We are also about a better conversation around death, dying and End of Life Choices. From 16-23 April Australia had its National Advance Care Planning week. If you follow us on Facebook, you may have seen our daily posts, which we kicked off with this cartoon. Have you thought about what's important to you? Chances are, you have. But have you talked about it with loved ones? Or have you put pen to paper to ensure your wishes are made clear, even if you're not in a position to communicate them? Chances are, you haven't. If you'd like to know more about the laws that apply to Advance Care Directives, visit the QUT End of Life Law website for a handy state-based summary. In our Resource Centre you will find further tools and and organisations that can help start the conversation. It's never too early to start, you're only ever at risk of not starting early enough. We are also working on some other exciting projects, that are still in the very early stages and not quite ready to share. 1. Consider a monthly donation. Our opponents are fully resourced and staffed. We cannot hope to match them by volunteers alone. Even $10-$20 a month goes a long way. 2. Encourage one new person to join our campaign. Then ask them to do the same. The law only changed in Victoria because many thousands of people stepped forward. But compassionate end of life choices shouldn’t stop at the Victorian border. We need you now more than ever. This January, the House took up four separate Death with Dignity bills, choosing to advance HB 2739, Our Care Our Choice Act, sponsored by Hawaiʻi State Representatives Della Au Belatti (D-Makiki), Mark Hashem (D-Hahaione), Nicole Lowen (D-Kailua-Kona), Sylvia Luke (D-Makiki), Dee Morikawa (D-Niihau), Scott Nishimoto (D-Kapahulu), Scott Saiki (D-McCully), Gregg Takayama (D-Pearl City), and Chris Todd (D-Hilo). This time around, the legislative outlook for supporters was positive. Would 2018 be Hawaii’s year? On February 28, the House Health and Human Services and Judiciary Committees passed the bill 4-1 and 7-1, respectively, paving the way for the landslide 39-12 vote in the full House of Representatives on March 6. The Our Care Our Choice Act received a major boost when Hawai‘i Governor David Ige said he would be “proud and honored” to sign the bill. The Senate worked quickly to move the bill through committees. The Senate Committee on Commerce, Consumer Protection, and Health on March 16, 2018 passed the bill unanimously. The Senate Committee on Judiciary passed the bill 4 to 1 on March 23, 2018. When the full Senate approved the bill on March 29, 2018 by a vote of 23 to 2, it became clear that Hawaii was on the verge of making history. Sixteen long years after the movement’s near-win, Death with Dignity advocates were one signature away from the Aloha State becoming the nation’s seventh jurisdiction with an assisted-dying statute. Today, Governor David Ige signed the Our Care, Our Choice Act into law. Starting January 1, 2019, Hawaii’s citizens will have the same compassionate end-of-life option that residents of Oregon, Washington, Vermont, California, Colorado, and Washington, D.C. enjoy. Reflecting on the legislative victory, Death with Dignity Executive Director Peg Sandeen expressed gratitude for the lawmakers and advocates who over many years worked to make policy reform in Hawaii a reality. “We thank the members of the Legislature who recognized that the will of voters could no longer be ignored and brought the bill forward to successful votes in the House and Senate. “As we celebrate the Governor’s signing this legislation into law, we cannot help but think of and thank the many citizens of Hawaii who worked for passage of this law, but never saw it come to pass. We thank them for the courage to speak out and begin this conversation. Everald Compton is Chairman of the LONGEVITY INNOVATION HUB, which is a not for profit entity implementing the Blueprint for an Ageing Australia. He was a Founding Director of National Seniors Australia. Everald served on its Board of Directors for 35 years and was Chairman for 25 years, retiring in 2010 when he took up a new role as Chairman of the Australian Government’s Advisory Panel on Positive Ageing for three years. The below article was published on www.everaldcompton.com on 31 January 2018. I am grateful for the gift of life that has been mine and I hope that I have managed to make a good contribution to the society in which I live. This being so, I don’t want to live if a time arises when I have no quality of life. At this point, I want out immediately, and if there are no laws authorising Voluntary Euthanasia in Queensland where I live, then I fully intend to do everything I can to bring on a good heart attack. I do not want to lie in bed like a vegetable and cause my family to make endless visits to my bedside to see someone who is simply not me, just an object of pity. I want them to remember me as an active and happy achiever who enjoyed their company. Their last sight of me must not be awful. And I want to save the nursing home fees so the money can be used to give my grandkids a great start in life. Clearly, the best outcome is for the Queensland Government to make it legal for me to voluntarily take a tablet. Typically and sadly, Queensland is the only Australian State never to debate Voluntary Euthanasia legislation. Every other State has tried, some several times, and finally Victoria won the battle last year, making a huge breakthrough about which I rejoiced. For some reason, Queensland tries to hang on to the past and fear the future, something our earliest pioneers definitely did not do. It’s out of character. Let us for a moment review the case for voluntary euthanasia. We will all die one day. It is inevitable. So, why go to extremes in perpetuating life when there can be not enjoyment of it. What are a few months in the whole fabric of our existence. I believe that I am entitled to a life choice and I have left a health directive where I declare that I want all the plugs pulled when my life has no quality. If that doesn’t work, I want a tablet or a needle or I will keep holding my breath for a long time. 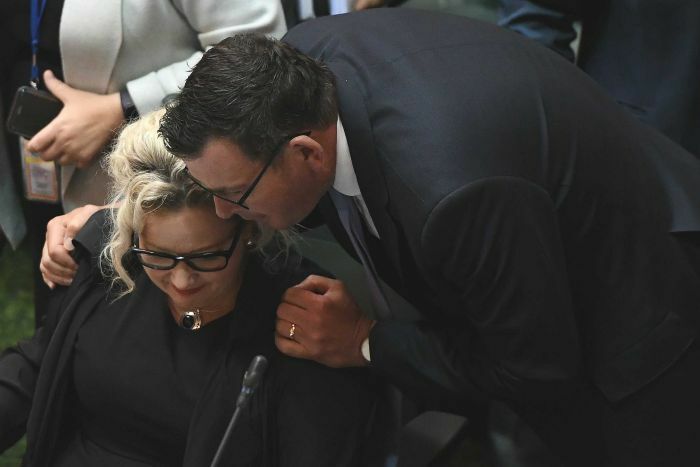 Opponents say that some children will use voluntary euthanasia to get their parents money as early as possible, but safeguards are in place in Victoria to stop this happening. It causes no problems for me, as I love and trust my family and have spoken to each one of them about my attitude to dying. They know and accept the circumstances when I want to go. Others say that palliative care is so good that people can be kept painless for months while they await death. This is quite simply a nonsense. Underneath the sedatives, the patient is under great mental stress as they struggle with the pointlessness of it all and its utter indignity. Others say that assisting someone to die is an offence before God. That is simply an attempt to put all the blame on God for everything. As a practising Christian, I do not believe that God decides who lives or dies. Jesus himself deliberately chose the time of his death. He had a number of options to avoid the crucifixion, but he chose to go to the cross. We all have the same choice. So, its time to stop making excuses and get rid of our fear of death. As death is part of life it must be rejoiced as if it is a birth. If I am fortunate enough to get some notice of my death, I intend to stage a lively party with my friends and family where we share a drink and remember happy days. I will kiss them all goodbye and close my eyes. If nothing happens, I will ask them to keep giving me full glasses of whisky until my old heart can take no more. I hope that the Queensland Government will legislate to take my death out of their hands and place it in mine. Democracy is totally about freedom of choice. Some MP’s fear losing their seats over this issue. They won’t. Politicians only lose when they sit on fences and forget about doing their job. Many MP’s also fear the clout of Churches whom they feel will be aggressively upset about this matter. Some will, but the reality is that few people now take any notice of Churches, sad though this is. As a long term Elder of my Church, I have to bear a heavy responsibility for this tragedy. I am not a fearsome character, but I want all my parliamentary friends to know that I am in their relentless pursuit in the cause of Assisted Dying. I will do it nicely, but ceaselessly. May grace and peace be with you all. On 12 October 2017 Dr Brian Owler, Chair of the Victorian Expert Ministerial Advisory Panel, addressed the National Press Club of Australia on the proposed Voluntary Assisted Dying legislation in Victoria. You can watch the address on the ABC National Press Club website here. You may download the full transcript as a PDF here. I acknowledge the traditional owners of the land on which we meet and give respect to Elders past and present. The desire to live is the strongest of human instincts. We fight for our own lives. We fight for others to live. Most people want to extend their life for as long as they can, and many will endure pain and suffering when there is hope of recovery or improvement. This article was first published in the The Herald Sun on 21 June 2017 as "Andrew Denton: We can put an end to the suffering of the terminally ill". As I’ve shared my story I’ve discovered I am far from alone. I have had hard-nosed politicians come to me and tell me — tears welling in their eyes — of how a beloved mother or father or uncle suffered in their final days. Daughters have written to me of how they pleaded with doctors for more pain relief for mum or dad, but were told it wasn’t possible. Recently, a Melbourne woman in her 50s told me of her husband’s last weeks of agony as he literally starved himself to death. Others have spoken of more violent ways family members have chosen to end their suffering. These have all been legal ways to die. They have been excruciating and they have left a devastating legacy. There is a constant chorus of these stories — and they happen even with the best of palliative care and with the best of medical intention. I watched my father, Kit, suffer needlessly before be died. It was terrible to watch and it's stayed with me ever since. Our ambulance workers and police know it better than most. They see first-hand the horrific ways in which some elderly, terminally ill people have ended their ordeal. A very clear majority of the community — about 70-75 per cent, even among Anglicans and Catholics — consistently support the idea that people in the final stage of life should be able to voluntarily end their suffering with medical assistance. In short this has become the personal story of so many people that there is a need for public policy to address it. We can’t continue to look the other way. Those who’ve witnessed the awful death of a loved one carry the trauma with them for the rest of their lives. They speak of an overwhelming sense of powerlessness in the face of desperate pleas from a loved one. And they speak, too, of guilt that they were unable to stop the suffering of those they love, even though they did everything legally available to them. Even though the medical profession did its best. We are all scarred by these experiences, particularly women, who make up 70 per cent of our carers. Andrew Denton with his father, Kit. Soon, a law for voluntary assisted dying will be debated in the state parliament. We have arrived at this point via an Upper House inquiry that ran for close to a year and heard from more than a thousand individuals and organisations across the state. The evidence they heard was powerful. By a 6-2 majority the cross-party committee recommended that there should be a voluntary assisted dying law for the citizens of Victoria. THIS law is not intended to take the place of palliative care, but rather to be one more option available to a patient and their doctors at the end of life. The truth is, despite all our advances in medicine, there are some for whom even the best palliative care does not work. A panel of medical experts is advising on how to implement a law in a way that assists those in need and protects the vulnerable. This has already proven possible overseas. There the majority of those who use the law are 70 years or older, are suffering from cancer and are in the final stage of life. In the US state of Oregon, those who use a voluntary assisted dying law account for less than 50 in 10,000 deaths. They have requested to use the law voluntarily and two independent doctors have agreed they have six months to live or less. Twenty years on, Oregon’s law is unchanged and widely accepted. Similar laws are now available to one in six Americans. The threatened “slippery slope” has failed to materialise — as have so many other dire warnings. A law to help society’s most vulnerable — those who are dying and beyond the help of medicine — now lies within reach of Victorians. A broad coalition for change has come together under the banner of our campaign, “Stop Victorians Suffering”. It brings together the voices of the terminally ill, carers, the elderly, those with cancer, motor neurone disease or MS or Huntington’s disease, nurses, doctors, retired police, ambulance employees … the list goes on. They are the people you’ll meet at the sausage sizzle after the kids’ sport. They are the people who make our communities and our neighbourhoods. And they are ready to let their local MP know how they want them to vote. We don’t expect our politicians to make law solely by opinion poll. But the sheer weight and breadth of support for a voluntary assisted dying law should tell parliamentarians this: first, most of your constituents will thank you for supporting the law, and; second, voters don’t want you to politicise this issue. It crosses all party lines because none of us knows when it may be our family that faces the hardest question: How can we help someone we love die, when only death will ease their suffering? 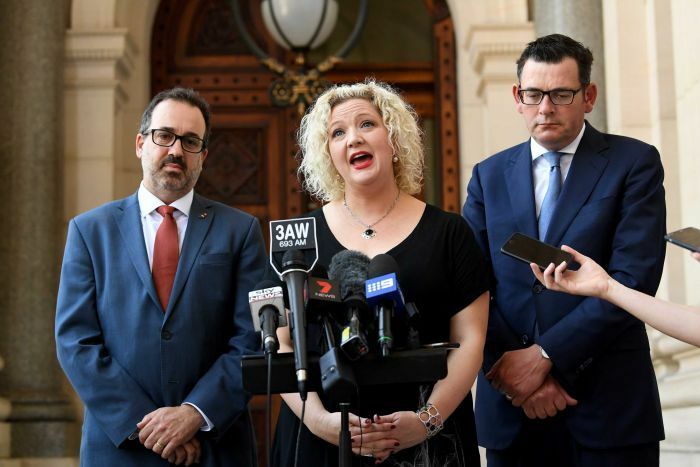 A Victorian nurse dying from an aggressive form of brain cancer is calling on State MPs to heed the will of the electorate and vote for a voluntary assisted dying law. Jen Barnes, from Inverloch in South Gippsland, has been a nurse for 40 years and received her diagnosis in May last year. She is fronting a new campaign, “Stop Victorians Suffering”, backed by Andrew Denton’s Go Gentle Australia organisation. Jen Barnes is being supported by her Melbourne-based oncologist, Dr Ross Jennens, who says ‘there is a small percentage of people whose suffering can't be controlled and currently the only other option available for those patients is suicide, which is not acceptable.’ Dr Jennens says the issue is one of ‘patient autonomy’. Jen Barnes says she is campaigning for choice at the end of life. “Palliative care in Victoria is very good but I’ve seen that for some it doesn’t work. “I may be lucky and I may just drift into a slumber. But I may suffer with seizures. I could certainly potentially be confused or have my words so jumbled that I make no sense. “I know that at some point in time they’re not going to be able to help me and they’ll say, ‘No, we can’t operate, we can’t give you treatments anymore, and this is the beginning of the end’. “I don't want to die. No-one wants to die. Because we all want to see the next grandchild, the next birthday, the trees bloom or whatever – we all want that. I’d like to be there for the 40th wedding anniversary with my husband, Ken. The campaign, being driven through social media, launched today via the Stop Victorians Suffering website, where you can sign the petition. Voluntary assisted dying legislation is set to be introduced to the Victorian parliament later this year by Health Minister, Hon. Jill Hennessy MP. The issue is set to be decided by a conscience vote. If the law is passed, it will come into effect from 2019. An expert panel headed by former AMA federal president, Prof Brian Owler, is advising the government on the detail of the legislation and is due to report by the end of July. Last year a cross-party Upper House committee of the Victoria parliament recommended the government introduce voluntary assisted dying legislation as an option available to adult Victorians who have only weeks or months to live and suffer from a serious and incurable illness. Independent opinion surveys consistently find around 75% support for a voluntary assisted dying law with strict eligibility criteria and strong checks and balances, to help the suffering and to protect the vulnerable. The most important feature is that the law will be completely voluntary: for patients, doctors and also institutions. No-one is ever forced to take part and there are strong safeguards to ensure this. Today Tonight Adelaide on Channel 7 nails it on how the legislators have failed us on voluntary assisted dying. Watch one woman’s story. Astonishing. This story was aired on 13 March 2017. Sometimes, even with the best care available, life hurts more than death. Unbearable suffering is forced upon the terminally ill - and their loved ones looking on - because Australia has no voluntary assisted dying laws. In 2017 that can change. This year the Victorian Government will introduce legislation for a voluntary assisted dying law. Every previous attempt has been defeated by people who insist that you must suffer for their beliefs. More than 70% of us want a choice about what happens to us at the end. But, right now, none of us have one. Your money will help us campaign so that your voice is heard loud and clear by Victoria’s politicians.